The future arrives with a tiger uppercut to the jaw in Street Fighter II, and the era of the one-on-one fighter kicks in. Mortal Kombat amps up the gore to “Fatality” level, while Virtua Fighter and Tekken take the combatants into three dimensions. Virtua Racing and later games like Daytona USA bring new levels of realism to racing games, while the trigger-happy arcade-goers get to take their shots at aliens, zombies and more in hits like Area 51 and House of the Dead. NBA Jam gives average joes control of their favorite slam-dunking superstars, while the all-stars of the future hone their skills on hoop-shooting basketball games. Video games get faster, louder, and more realistic, but at the end of the decade, Crazy Taxi reminds us what the arcade has really always been about: wacky, unbridled fun. 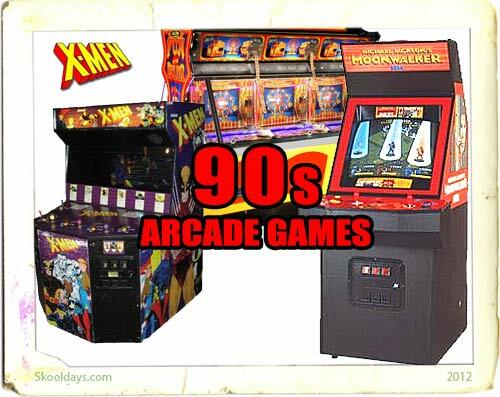 This entry was posted in Arcade and tagged 1990 by Skooldays. Bookmark the permalink. looking for an arcade game 1970 early 80’s don’t remember much just the the little man would say “one more” when he picked up a bag of money or a diamond it was an undergrond game. I think he would also say supla! Nice content! I noticed the list is missing Cadillacs and Dinosaurs, Snow Bros and Robocop games. They were also very popular, at least in the arcades that I had been to. it was side scrolling shooter game. not 100 percent sure on content but i do rememeber riding a fish or something, and there was a boss that was a fish and you shot it, it changes colors with damage and the scales fell off. any idea on what this game was called?